Owning a cat is great. In fact, it is true that cats can be one of the best companions ever. As long as you’re good to your cat, he or she is going to be loyal to you for their entire life. Just remember that you’ll need to add more duties to your life. You’ll need to ensure that your cat is taken care of properly. This means that you’ll need to keep your cat fed. This is why you should consider buying the best automatic cat feeder. Within this guide, you’ll learn how to find the best one for your money. The Cat Mate C500 is an excellent investment for anyone who owns a cat or dog. This specific feeder is designed for cats and small dogs. The unit is capable of serving up to five meals before you’ll need to refill it. On top of that, this unit can be used with twin ice packs. This ensures that your cat’s food is going to remain fresh almost all day long. Below, you’re going to learn more about this specific unit. One of the best things about the Cat Mate C500 is the guarantee. This specific pet feeder is protected by a 3-year guarantee. If anything goes wrong or you’re not satisfied with the product’s performance, you’ll definitely want to take full advantage of the guarantee. The company will do their best to ensure that you’re satisfied at the end of the day. You’re also going to love the programmable operation. With this unit, you can schedule feeds throughout the day. This will remove the responsibility from your hands. Just let the unit know when you want to feed your cat and it’ll do the rest. The Cat Mate C500 is great. It is reliable and high-tech. If you want to spend a little extra to get a high-tech solution to the problem, this one is worth checking out. You will not be disappointed. The SureFeed Microchip Pet Feed is fairly expensive. Nevertheless, it could be well worth it in the long run. It has a big bowl capacity and the battery life is impressive. Plus, this feeder is equipped with a training function. This feature helps get your pet familiar and comfortable with the feeder. This almost guarantees that they’re going to use it after a brief period of time. The SureFeed comes with a great battery life. In total, the batteries are going to last 6 months. That is excellent and far better than what you’re going to get with the alternatives. Plus, you won’t have to worry about using a power cord. You can basically put this feeder anywhere in your home. Another great thing about this feeder is the fact that it can be used with wet and dry food. 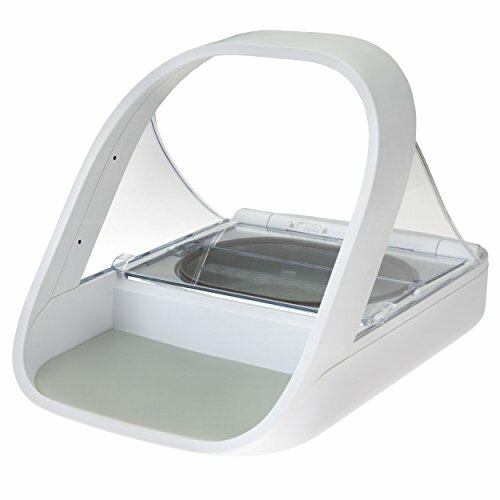 This feeder is capable of keeping both foods fresh for a much longer period of time. The sealed bowl works exceptionally well for this specific purpose. The SureFeed Microchip Pet Feeder is fairly expensive. Still, it is going to be worth it in the long run. It works great and it is going to keep your pet’s food fresh for much longer. The perks make the extra price well worth it. 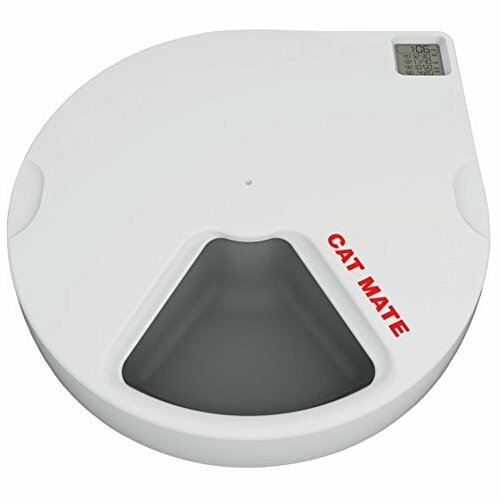 The Cat Mate C20 is a bargain solution to your feeding problem. This is really one of the most convenient pet feeders out there. It is very easy to clean. Plus, the lids and bowls and dishwasher proof. This will make the cleaning process so much quicker and easier. This one will also keep your pet’s food fresher. More details about this pet feeder will be provided below so you can determine whether or not this one is right for you. One thing to note is that this unit is equipped with a timer. This is going to make your job easier. You’ll be able to set the timer and let it go. Once the selected time has passed, the lid will open and your pet will be able to eat right away. If you want maximum peace of mind, you’re going to love this pet feeder. In total, it is protected by a 3-year guarantee. This will give you three full years of confidence. Should anything go wrong, you just need to get in touch with the company. They’ll do the right thing and fix things for you. The Cat Mate C20 is a good investment for the low price. If you’re looking for a bargain solution, the Cat Mate C20 is for you. Do you want a high-tech pet feeder that will take the responsibility off of your shoulders? 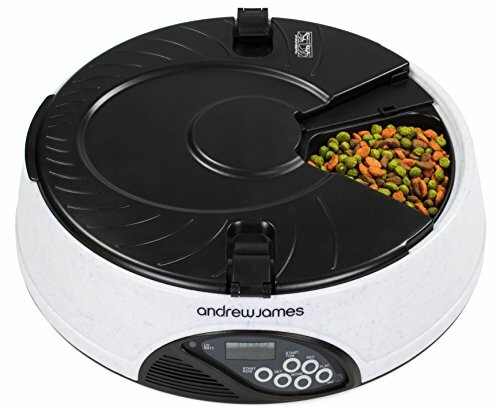 If so, you’ll definitely want to check out the Andrew James Pet Feeder. This pet feeder is moderately priced, yet it still comes with pretty of high-tech features. For instance, it includes a timer and a voice recorder. On top of that, it features anti-tamper lids. 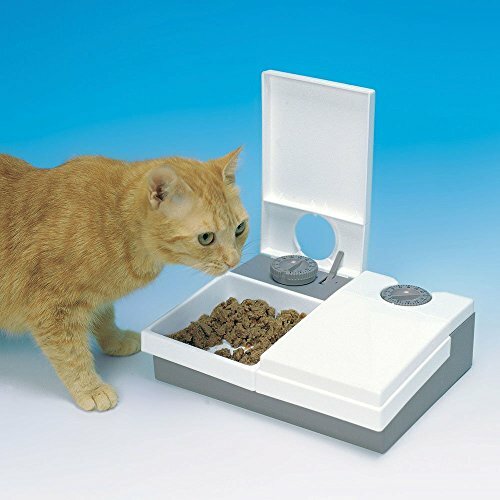 This ensures that your cat won’t be able to get into the food until the feeder releases it. First and foremost, you should know that this pet feeder comes with a 2-year warranty. It might not be as long as some of the alternatives. However, the 2-year warranty is good. This is definitely true when you’re working with a company like Andrew James. You’re also going to love this pet feeder’s voice recorder. This gives you the option of recording a voice message that lasts a maximum of eight seconds. You can use the voice recorder to let your pet know that it is time to eat. The Andrew James Pet Feeder is a good investment at a decent price. It is high-tech, reliable and covered by a 2-year warranty. It is certainly worth checking out in greater depth. The DreamU Automatic Pet Feeder is one of the most expensive pet feeders out there. Nevertheless, it’ll make a great investment. If you’ve got extra money and you want the best of the best, you should not hesitate to buy this one. This one is capable of holding up to 6L of food. This ensures that the feeder can be used to dish out four meals each and every day. Each can dispense out 1 to 39 portions. This pet feeder is equipped with a voice recorder. This gives the user the ability to record their voice for ten seconds. This will allow them to play a message to their cat. This is a good way to let your cat know that it is time for them to come and eat. This feeder can be powered in two unique ways. You can use 3 D batteries. They’re not included. Or, you can rely on USB power. Either way, it is nice to have options. The only downside is that D batteries can be pretty expensive. 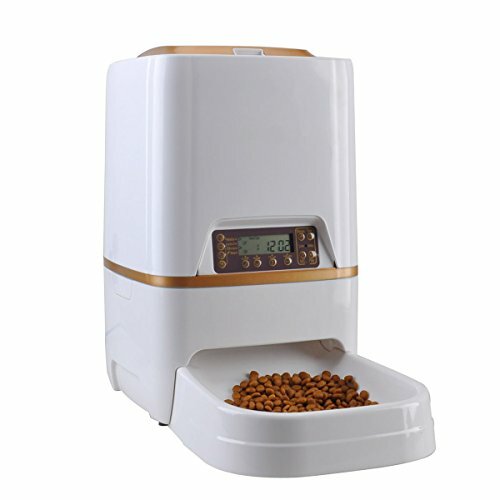 The DreamU 6L Automatic Pet Feeder is good but very expensive. It comes with some advanced features and this definitely helps to justify the price tag. If you’re willing to spend a little more, you should definitely check it out. Before buying an automatic cat feeder, you should take the time to consider a handful of factors. If you do not, you are probably going to regret it in the long run. Below, you’re going to learn about the most important factors of all. First and foremost, you should think about the capacity. Each cat feeder is going to be different in this category. The tank capacity is going to determine how much food the feeder will be able to dispense before the tank needs to be refilled. You probably do not want to refill the tank more than once a day. Therefore, you should try to get a bigger capacity. This will reduce the frustration and ensure that your cat has plenty of food to eat all day long. You also need to think about the power options. The cat feeder has to be powered one way or another. Is it powered by batteries or a power cord? This is vitally important. The corded option is good, but it is going to restrict your options. You will need a power outlet nearby or you won’t be able to power the unit. Batteries are good, but it can be expensive to replace them so frequently. Consider all of your options and go from there. While you’re at it, you’ll want to carefully examine the base material. Some materials are going to be better than others. If the bottom material is not good, there is a good chance that the unit is going to slide around. Therefore, you should choose a non-skid bottom. This will ensure that the feeder remains in place at all times. Finally, you should take the time to consider the set-up process of the feeder. Some are going to be more difficult to set up than others. Make sure that you can get the feeder working within a short period of time. You should be able to turn it on, fill it up and begin using it within a matter of seconds. This will make your life easier and it’ll ensure that the frustrations are reduced.